On August 6, 1890, New York executed William Kemmler. It was the first time ever a state used the electric chair to carry out an execution. Proponents of electrocution - including Thomas Edison - touted the new method as quick, effective, painless, and humane: the same arguments later used by legislators to support lethal injection and execution by nitrogen gas. 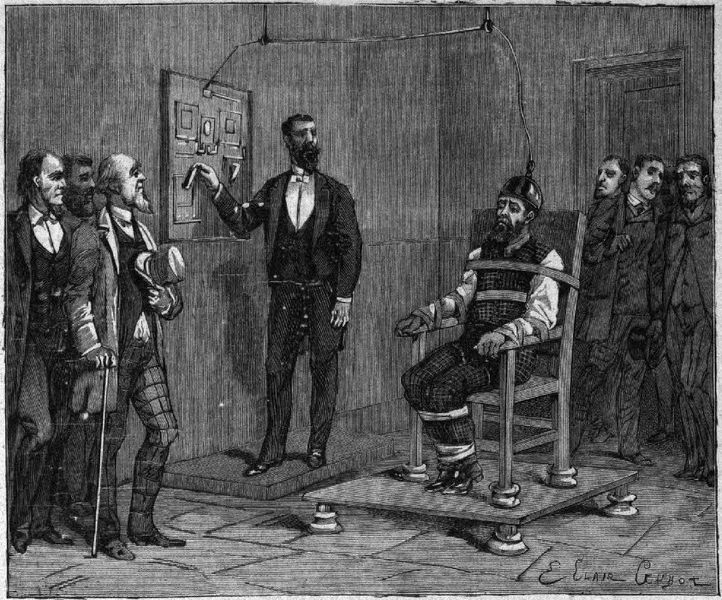 In May 1890, the U.S. Supreme Court rejected Kemmler's challenge that the electric chair was cruel and unusual punishment. "Punishments are cruel when they involve torture or a lingering death," the Court wrote. But it said the New York legislature in enacting the electric chair statute had intended "to devise a more humane method" of execution and "presume[d] that the legislature was possessed of the facts upon which it took action." The execution proceeded. According to the Buffalo News, Kemmler - who was intellectually disabled - asked corrections officers: "Don't let them experiment on me more than they ought to." After an initial 17-second administration of high-voltage electric current, a doctor declared Kemmler dead. Then Kemmler let out a deep groan and witnesses reportedly screamed "Turn on the current!" Reports of the execution say that "After 2 minutes the execution chamber filled with the smell of burning flesh. 2 of the witnesses fainted. Several others were overcome with severe attacks of nausea." Newspapers called the execution a "historic bungle" and "disgusting, sickening and inhuman." States have carried out 158 executions by electric chair since 1973. 10 were botched. Virginia was the most recent state to use the electric chair, executing Robert Gleason in January 2013. (S. Meehan, "Aug. 6, 1890: Buffalo man is first to be executed by electric chair," The Buffalo News, Aug. 6, 2015; "Kemmler's Death by Torture," New York Herald, Aug. 7, 1890; In re Kemmler, 136 U.S. 436 (1890).) See History of the Death Penalty and Methods of Execution.